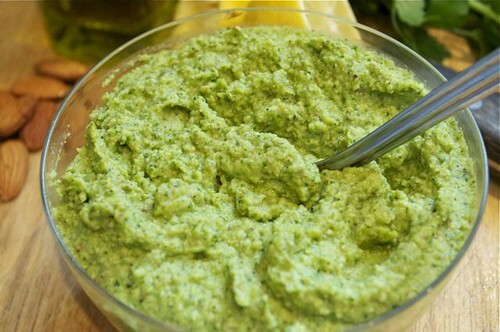 Why do I love “pesto” – let me count the ways! At the top of the list, is that it is in fact a method, as opposed to a specific recipe – and what a versatile method it is! Takes hide-the-veggies to a whole new place, and in the process (no pun intended), adds a whole whack of goodness to all sorts of things without even trying! 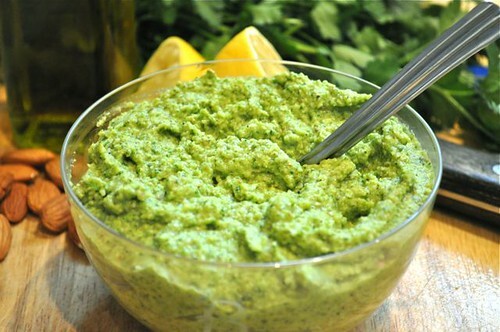 Green vegetables beware – most of you can be pulverized into submission and reappear as a delectable pesto, headed for dozens of dishes – pasta, rice, potatoes, meats, chicken, fish, salads, dips & dressings – a more glorious way to eat your greens has yet to darken my door. Yes, it did get its start in northern Italy made from the classic combo of garlic, basil, pine nuts, olive oil & parmesan, but with a little imagination, which I tend to turn to from time to time – other greens can stand in for basil, other nuts can mimic pine and the cheese, well, the cheese can stand alone, in fact, the cheese doesn’t even have to show up! 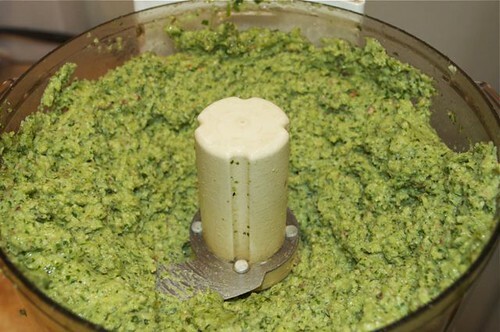 The word pesto actually refers to the original prep method – in a mortar, with a pestle. 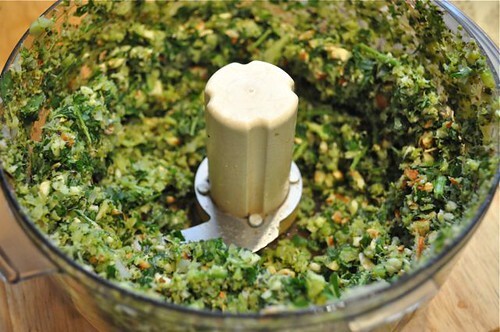 Talk about labour intensive, so thank God for the food processor – I’m sweatin’ just thinking about pestling greens into a paste. 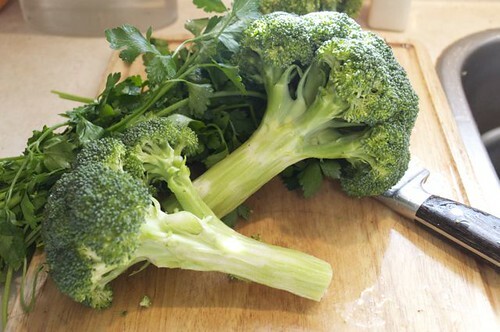 So, go get yourself some greens, and in this case, broccoli – round up the supporting cast, and with a flick of a switch, you’ll have what it took ancient Romans a fair amount of elbow grease to produce – we’re talking a serious upper body workout – imagine pounding pesto for a party circa 1500 – that begins to explain those ripped Romans! 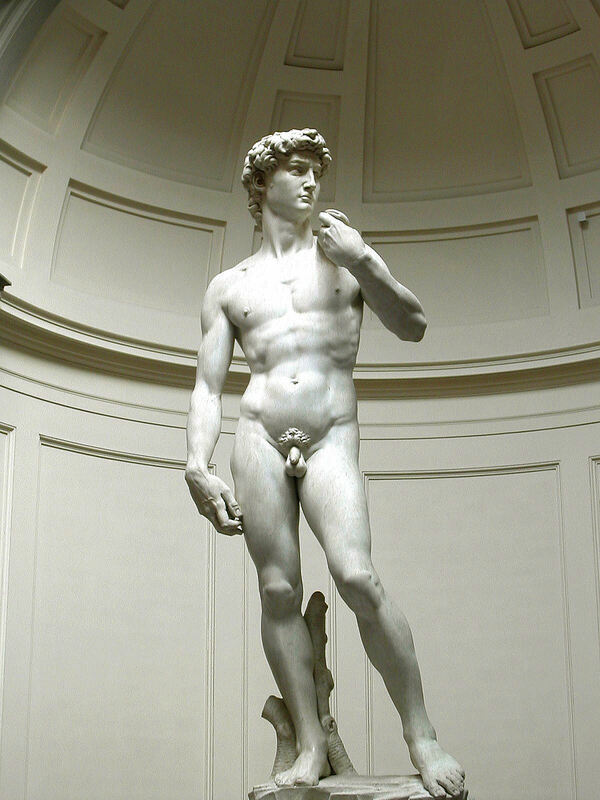 Sigh … I’m back. 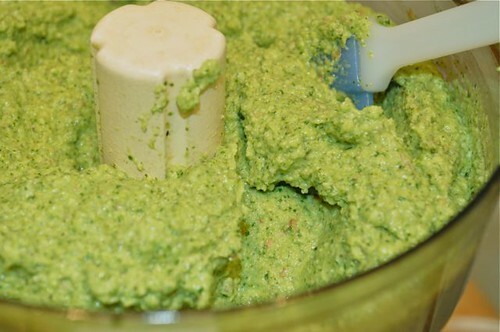 Without further ado – I give you broccoli pesto! 1. 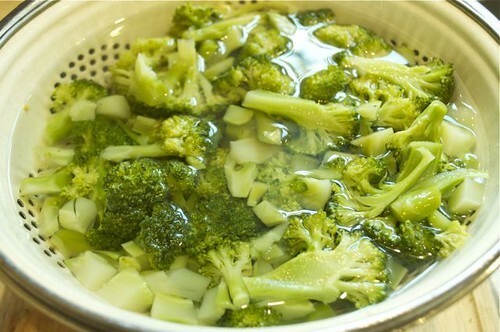 Rinse and clean up 2-3 stalks of broccoli. 2. 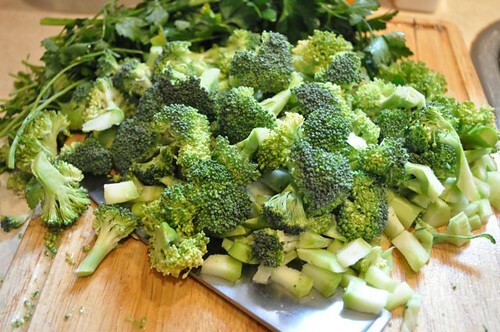 Chop them into small pieces, roughly the same size. 3. Cook it until it is quite tender – beyond fork-crisp. 4. 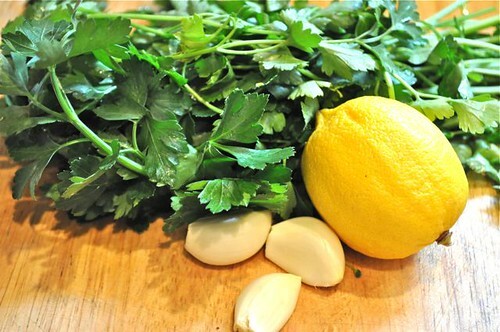 Meanwhile, get your parsely, garlic and lemon prepped. 5. Juice half the lemon. 6. 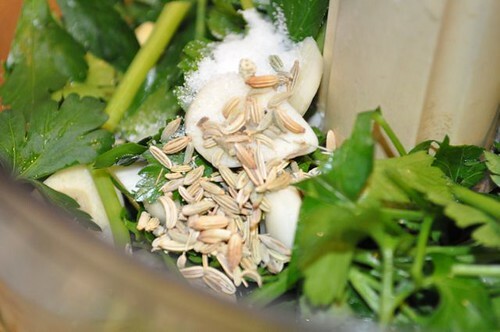 Roughly chop the parsley and garlc. 7. Put them in the food processor. 8. 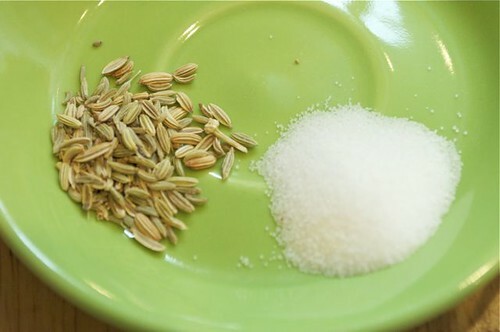 Salt & fennel seeds are next. 9. 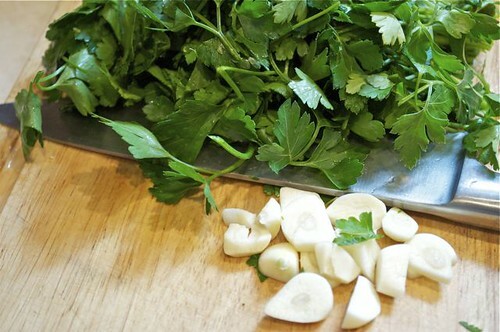 In with the parsley and garlic. 10. 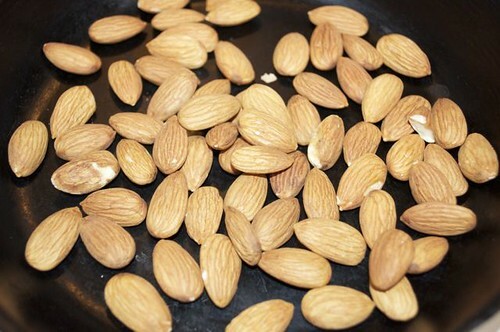 Measure 1/2 cup of nuts – almonds, walnuts or even pine nuts, if you’re feeling extravagant! 11. 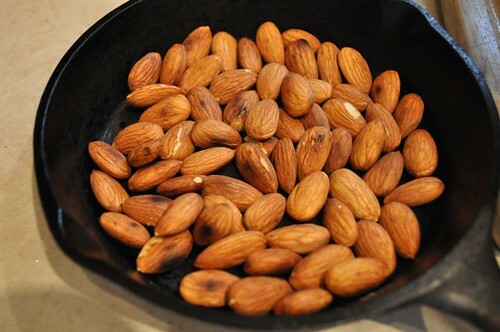 Toss them in a dry pan to toast. 12. See? Nice and toasty – tasty! 13. 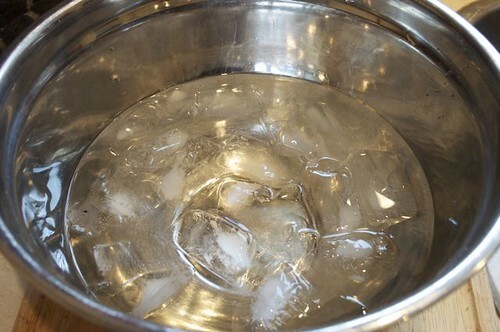 Get a bowl large enough to hold your colander and fill it with ice and water. 14. 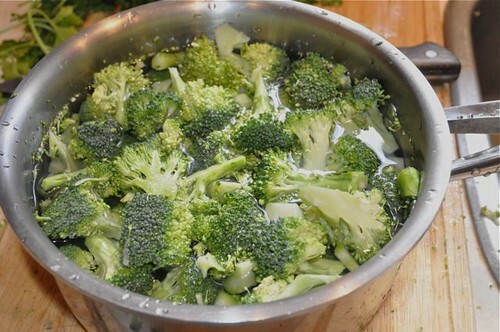 Drain the broccoli in a colander and lower it into the bowl of ice water – the broccoli should be fully submerged. The idea is to cool it off ASAP. 15. 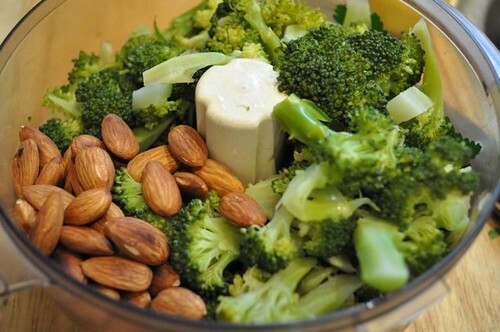 Add the cooled broccoli and almonds to the processor – now you’re ready to fly! 16. Whizz for a few seconds and stop to scrape down the sides before whizzing some more. 17. 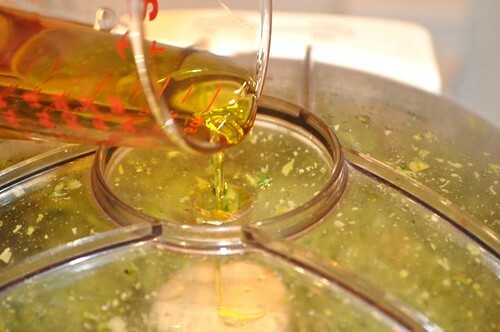 With the machine running, slowly drizzle in the olive oil. 18. Come together – right now – over me! 19. 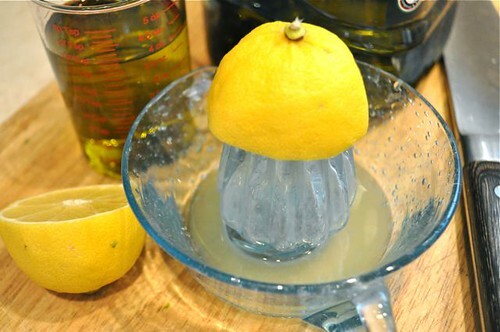 Finish with the lemon juice and give it another whizz. 20. Taste and re-season if you feel it needs it. 21. 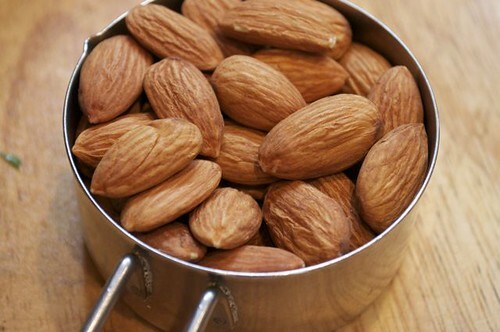 Get it in a bowl. 22. 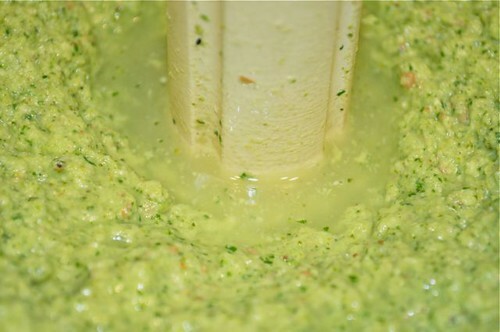 And you’re ready for your close-up – broccoli pesto – armed and delicious! 4. Scrape down the sides of the bowl occasionally to keep everything moving. Taste and season accordingly. Transfer to a container and refrigerate. 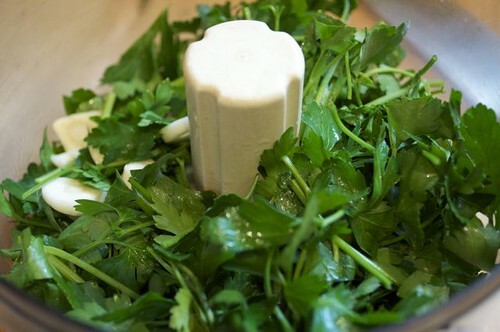 When tossing this with pasta, reserve a cup of pasta water to thin the sauce – the amount of pesto you’re using will determine the amount of water required to create a saucy consistency.